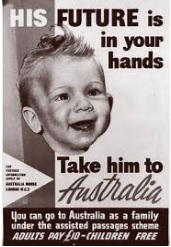 More than one and a half million Britons left for Australia in the quarter century following the Second World War. Most of the migrants came under an assisted passage scheme through which adults travelled to Australia for just £10 whilst children travelled free. These British immigrants comprised one of the largest planned planned migrations of the twentieth century, and they become known to most Australians as the "ten pound Poms" (the term was misleading since, as Scottish and Welsh migrants are quick to insist, the word 'Pom", whether used in a derogatory or affectionate sense, refers to English migrants exclusively). 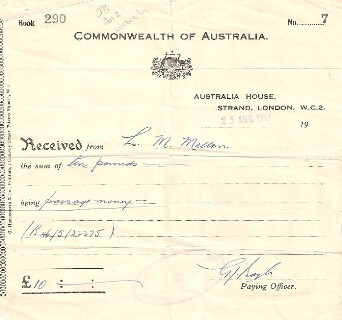 Throughout the postwar period more Australian immigrants came from Britain than from any other country (it was not until 1996 that Britain was pushed into second place by settlers from New Zealand) and though Australia's massive postwar immigration scheme included large numbers of migrants from other, non-English speaking countries, through the 1950s and 1960s the British comprised never less than a third, and at times more than a half of all settler arrivals. And yet the British were to become 'invisible migrants' in a number of ways. The British had controlled and dominated the European settlement of Australia in the eighteenth and nineteenth centuries, and thus ensured the predominance of the English language and the adaptation of Australian cultural and political life to British ways. It was assumed that twentieth-century British immigrants would assimilate easily and thus 'disappear' into such a familiar society. Immigration Minister Harold Holt claimed in 1950 "this is a British community, and we want to keep it a British community'. It was assumed that the British migrants would fit easily into Australia's "British Way of Life". 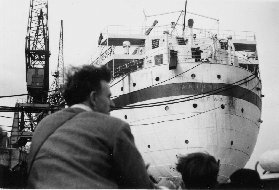 Many Asturias passengers kept a diary of their voyage to Australia from the UK, or have since written an account of their trip and experiences when they arrived in Australia. Their stories can be read in our Passenger Stories section. 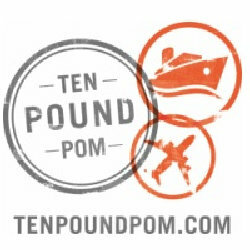 Visit this extensive website dedicated to Australia's immigration history, in particular 'ten pound poms'.